Burmese to English language translation software official site. 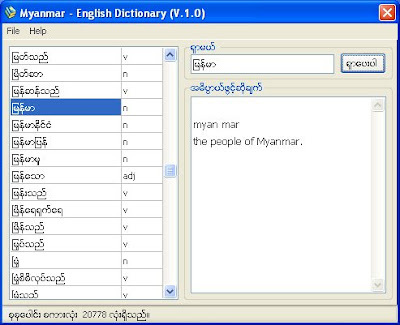 English-Myanmar Dictionary (Version 1.0) released. 4.You can add/edit or remove words. 1. Microsoft Windows XP or Windows 2000 and above. Tested on Windows XP Professional SP2 and Windows 2000 Professional SP4 on a tablet PC. Many efforts have been made for this program to be sure it works fine. No one is perfect, if you found some bugs(problems), please report me any bugs you encountered with full details. If it is Database related problem, you can even add/edit database file your self. (You can see database "entab.tsv" file in the program folder). If you found a word "applf" instead of "apple".Just open database file in a text editor and edit it. If you can't find a word/new word "Aung San".Just open database file in a text editor and add it. Since database is just a plain text file, any one can edit contents of the file. Each word is separated by a TAB. Just make sure you save the edited file with UTF-8 encoding. Pictures are located in "Picture" folder. You can add/remove pictures your self. Human Voice files are .mp3 files and located in "Voice" folder. You can add/remove voice files your self. There is no HELP file available at the moment. This program is very simple to use and i don't think it is necessary. But every program should have a Help or Using Manual file. If someone can write a help file for this program in Burmese or English. I will include help file in future releases. You can write text in MS Word and I will convert to help file ".hlp" or ".chm". To be honest, I can't make all words, pictures and sound files my self and test all words,pictures,sounds files are correct. REMEMBER, only your bugs reporting and help will make this program better. I made this program in my free time. Hope it useful! 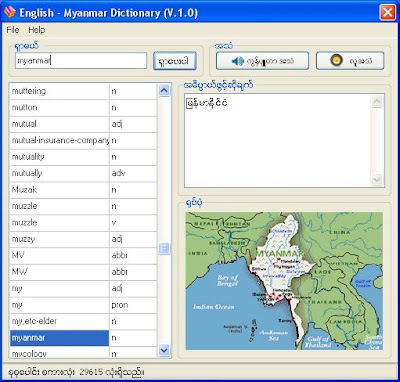 Myanmar-English Dictionary (Version 1.0) released. 2.You can add/edit or remove words. from Saing khan Tun (http://saingkhantun.opensource.my). (You can see database "saidict.tsv" file in the program folder). Since database is just a plain text file, any one can edit contents of the file with a text editor. Each word is separated by a TAB. Just make sure you save the edited text file with UTF-8 encoding. Copyright 2009 Nyein Chan All rights reserved.